Research papers on due process of law going into the process of legal requirements in which the state must assure that all rights to which an individual is entitled are respected. Research papers that examine the Legal Code of the United States cover aspects such as the Due Process of Law. Have the writers at Paper Masters that have law degrees assist you with understanding and researching how various laws have come into being and what they entail. Due process of law is a legal requirement in which the state must assure that all rights to which an individual is entitled are respected. In modern legal terms, due process limits legal proceedings so that judges are the final arbiters of fairness under the law. Due process of law, as a concept, originated in 1215 with the Magna Carta. The Fourteenth Amendment, passed in the wake of the Civil War and has been the most profoundly transformative Amendment in American history. Both of these amendments contain due process clauses. In these cases, the due process of law acts as a safeguard from the arbitrary denial of the basic freedoms of life, liberty and property. 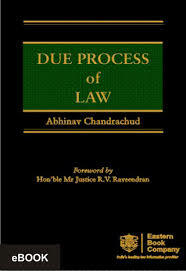 In modern legal parlance, then, due process of law is the principle that the individual cannot be deprived of life, liberty or property without the appropriate legal procedures. Much of modern legal understanding of the due process of law stems from the 1897 Supreme Court decision Allgeyer v. Louisiana, in which the Court first used due process to overturn a state statute. Under due process of law, legal procedures must be followed for each person so that no one receives either prejudicial or unequal treatment. Educational Law - Educational Law research papers discuss topics and ideas for educational law research papers. The Constitution - A research paper on the Constitution discuss the document, written in the summer of 1787, that outlines the government of the United States of America. The Scottsboro Boys - The Scottsboro Boys case ruined the lives of the black men charged, ended the career of a judge, and polarized the sense of justice of a nation. Megan's Law - Megan's Law Research Papers go into how this law came into effect. Rights of Crime Victims - Rights of Crime Victims research papers overview various groups and legislation that illustrate the rights of crime victims in society today. American Civil Liberties Union - The ACLU is especially concerned with protecting the citizen's First Amendment rights, equal protection under the law, due process and the right to privacy. Criminal Trial Process - Criminal Trial Process Research Papers look at the four main parts of a criminal trial, and discuss each in detail. The First Amendment - The First Amendment research papers discuss the right to privacy of all U.S. citizens. Search and Seizure - Search and Seizure research papers debate the Fourth Amendment of the United States Constitution. Paper Masters writes custom research papers on due process of law going into the process of legal requirements in which the state must assure that all rights to which an individual is entitled are respected.